Solving the world's water problems is proving to be one of the greatest investment opportunities of our time. Already, world water supplies are inadequate to meet demand, and the problem is going to get much worse in the years ahead. The World Bank estimates that 1.1 billion people lack access to safe drinking water and about 50 percent of the world's hospital beds are populated by people who have contracted water-borne diseases. If present consumption rates continue, in 25 years the world will be using 90 percent of all available freshwater. To address the problem, trillions of dollars will need to be invested in water infrastructure projects. And while the problems are most acute in developing and rapidly growing economies, there are huge water infrastructure needs in industrialized countries, as well. In the U.S. alone, it's estimated that more than $1 trillion will be needed for water and wastewater infrastructure projects. 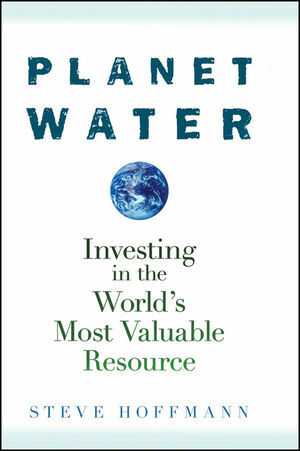 In Planet Water, water investment expert Steven Hoffmann explains the dynamics driving the water crisis and identifies investment opportunities in various sectors of the water industry. Hoffman provides investors with the knowledge and insights they need to make informed investments in water utilities, as well as companies providing water treatment services; infrastructure services; water monitoring and analytics; and desalination services. He also discusses mutual funds and ETFs that specialize in water stocks. Investing in the water industry is certainly no pie-in-the-sky idea. Over the past five years, many water stocks have exploded in value and water stocks as a whole have outperformed the S&P 500 by a substantial amount. In Planet Water, Hoffmann provides investors with everything they need to profit from this fast-growing industry in the years ahead. Steve Hoffmann is the founder of WaterTech Capital, a private investment company that specializes exclusively in consulting and investment opportunities within the water industry. With over twenty-five years of experience in the water industryas a water rate designer, resource economist, entrepreneur, and investorHoffmann has witnessed firsthand the dramatic transition of the water business. He was one of the earliest financiers to recognize the potential of water as an investment theme, and has been a contributing editor to the Water Investment Newsletter for more than fourteen years. Hoffmann is also cofounder and principal architect of the Palisades Water Indexes, which serve as the tracking indexes for several leading water ETFs. Chapter 1. Water: Prerequisite for Life, and Living. Chapter 2. The Global Water Condition. The Human Cost of Waterborne Disease. Overview of Water Reguation in the United States. The Institutional Impact on Water Investing. The Role of Water in Economic Growth. Chapter 3. Public Good, Commodity or Resource? Water as a Public (Social) Good. The Answer: Water as a Resource. Chapter 4. The Cost of Clean Water. The Global Cost of Clean Water. From the Whole to the Parts. The Transition from Cost to Price. Part II. Investing in Water. Chapter 5. The Business of Water. Drivers of the Water Industry. Regulatory Providers Face Regulatory Burdens. The Future of Water Utilities. Chapter 7. Centralized Water and Wastewater Treatment. Chapter 8. Decentralized Water and Wastewater Treatment. The Roots of Decentralized Treatment. Membrane Bioreactors: The Future of Decentralized Treatment. Chapter 11. Water Resource Management. Water Supply: Reservoirs and Dams. Part III. Water Beyond the 21st Century. Biosolids Management: There's Money in Sludge. Regulating Nonpoint Sources of Water Contamination. Pharmaceuticals and Personal Care Products. Chapter 14. Water As An Asset Class. Is Water an Asset Class? Chapter 15. Climate Change and the Hydrologic (Re)Cycle. The Windfall Profits Tax…On Water. The Age of Ecology, Again. Is Water The Next Oil? Chemical Contaminant Candidates or CCL3 Candidates. Named a top investment book of the year by the Stock Trader’s Almanac 2010.